The most important thing to make sure you understand about a transition to OpenOffice.org is to run a good hard pilot program first. But this is a very very close second. The more tech-savvy you are, the more serious mistakes you can make in an OpenOffice.org transition. It's very likely that you can't trust your own judgment. Not when it comes to evaluating how users will be able to make the transition. Because the following, more or less, describes most IT directors or people in related positions who will evaluate and choose OpenOffice.org. And these attributes color how you consider other people's skillsets. You are an experienced computer and find it inconceivable that people don't have at least basic computer skills. You've used a dozen text editors and while you love vi and emacs, you don't really care which one you use. You have no emotional attachment to the current office suite. You understand how office suites work. You have text, you format it; you have cells, you refer to them; they're all pretty much the same. When you learn a new office suite, you just transfer your existing knowledge to a new set of navigation. If you run a 10-person geek-heavy startup company, all of these assumptions are fine. If you run any non-software business, a city or county government, a volunteer organization, or anything else that is not a small techy company completely populated with intense techy people, then you probably don't really know your users' skill sets. If you don't take some time to triple-check your assumptions and realistically evaluate their skill sets, then formulate plans to address related issues, you're going to have some serious bumps when you transition to OpenOffice.org. Note: This is not in any way meant to be condescending. People have all different skillsets, from computers to people skills to decouppage to athletics, and the person who is disinterested in, or struggles with, document margins is sometimes the one who knocks you out on the dance floor or gives the speech at the annual conference that has the salespeople on their feet, cheering. This blog is to help the people in charge of transitioning users to new software ensure that those users have the skills, confidence, training, etc. necessary to do their jobs. The usual ways. Observation. Reading posts and comments online. And through my own experience when I started to do training. I had been a techwriter/course developer in high tech for 12 years when I started doing OpenOffice.org training. I used styles, I coded raw HTML, I'd used four operating systems, etc. I didn't think of myself as techy because I was usually surrounded by people who, for instance, had written the Java certification exam. But I was way more experienced in how to use office suites, especially word processing programs, than the folks I was training. So the class on how to use styles and master documents wasn't a great success. ;> So I quickly backpedaled and refocused and rewrote the training materials to suit the audience, their experience, and what they needed. You can have a very successful transition to OpenOffice.org even if you have users with limited software skillsets. You just need to work with your users as they are. And since you're very different from them, your unconscious assumptions are likely going to lead you astray. Let's go back to the numbered list. 1. You are a techy and you just don't understand how someone can not understand how things work. It's like being able to read, maybe, and not know how someone can look at a word and not sound it out. Even if you field really basic questions from your users every day, they don't ask you all the questions. And they just skip some of the questions they should be asking. Get a sense of what their skills really are. In a nonthreatening way, either send out a little questionnaire, have a short session where you put people through their paces on some basic skills, or just send out some of your non-threatening IT folks to observe people doing their jobs. You'll find that a lot of essentials, like being able to navigate a file system, are missing. A lot of people never learned to choose File > Open and go up or down a level to find a file. Likewise, a lot of people never learned to right-click, they don't know how to do it and they don't know what a great way it is to figure out where a feature they need is. You can offer people training (and of course having the authority to make it required means they'll come to it). Possibly start with fundamentals of computers and go from there. You can do daylong sessions, CBT, little tips and tricks every Wednesday at lunch, give prizes to the department that does the most entries on the Internal Tips and Tricks FAQ, whatever. It's all doable. You just need to know what you're working with, and help people get the skills they lack and that can make them happier and more productive. 2. You have no idea how they really feel about transitioning. You think, what's the big deal? It's just another software program. This is kind of related to #3, which I'll get to in a second. But hearing that they will be switching to an office suite they've never heard of (or even if they have heard of it) fills people with panic. Fear. Hostility, sometimes. It's fear of the unknown, fear of learning things they don't feel comfortable with, fear of losing skills and ability to do their job that they feel are tied to the software they use. All very normal and human and addressable but they are NOT the feelings you would have. How do you address fear and panic? Well, one very practical way that's kind of offtopic is to reassure them that any massive document conversion will be taken care of. Conversion is a big issue people panic about. Also, since it's partly fear of the unknown, show them the software. Have brief 15-minute presentations or CBTs where you run through the software and show just a couple features. Bold Italic Underline, and colored text one week. Send as PDF another week. Show a cool feature like the prefab graphics as a fun feature; people like graphics. Put a bunch of clip art in the Gallery and show that another week -- ditto. Reassure them that you're not just going to slap it on their desks and make them use it without books or training. Reassure them that there will be a transition period where they can work with it and learn it. This needs to be absolutely clear to everyone in your organization. If using a particular tool to do certain tasks in the person's job description, then that person has an obligation, both ethical and legal, to learn to use that tool to the best of their abilities. This applies to computers and whatever software is installed; hammers; backhoes; or whatever the tool is. See the addendum at the end of this post for a suggested rough draft of the email from the CEO about the transition. 3. You see how similar OpenOffice.org and Microsoft Office are. Going from choosing File > Page Setup to choosing Format > Page Setup poses no problems for you. But these are problems for users. Many people just concentrate on what menus and buttons to click to do their job; they don't generalize those skills so that they can easily reapply them in a new piece of software. They feel like they're starting over when they switch to a new word processor, even though the fundamental principles are the same. This is why they panic at the idea of change. They think their ability to do their job is tied to their current office suite. They think if you take away MS Office or Word Perfect, they'll be no better than an intern off the street. Maybe they fear losing their job, or at least losing their self esteem at performing their job well. So how do you deal with this? It's nothing terribly original, but when you realize that they aren't going to be able to generalize their skillsets to OpenOffice.org on their own, you can give them the resources they need to learn OOo. DON'T JUST INSTALL OPENOFFICE.ORG ON THEIR COMPUTERS, THROW THEM A FEW CLUESHEETS, AND FIGURE YOU'RE DONE. This is a really good way to increase support calls by an order of magnitude, make people resent you and OpenOffice.org, and risk having the transition fail. Essentially, switching some people from MS Office to OOo is like taking a macro and changing the name of the variables. Only the names have changed, but the macro is going to break. You have to make sure people know how to use the program before they have to start doing their jobs using the software. This might not involve a lot of training. If people do the same five tasks all day long, then find out what those tasks are, train them on those tasks, leave them documentation for how to do those tasks, and that could be all you need to do. If there are some tasks that are more difficult in OpenOffice.org than the other office suite, then try templates, styles, menu and toolbar modification, or consider just reassigning a few tasks to another person or group. Increase their confidence along with their skill sets. Show them something new and cool, like making a shortcut under Tools > AutoCorrect, Replace tab; or using the drawing tools under View > Toolbars > Drawing. When you make them feel good about their skills and the program, everyone wins. The key thing is, don't make assumptions about skills users have, even when they seem natural and easy -- to you. If you can use OpenOffice.org easily and if your 10-year-old son picked up Openoffice.org in about 15 minutes, that has no bearing on whether or not your users will be able to pick it up on their own in the same way. And I'm sure in some situations, some rare situations, I'm wrong. But in my experience, this is the case. Just be sure you know the real situation, the real users you're transitioning, and address them as they are. And you, and they, will be fine. 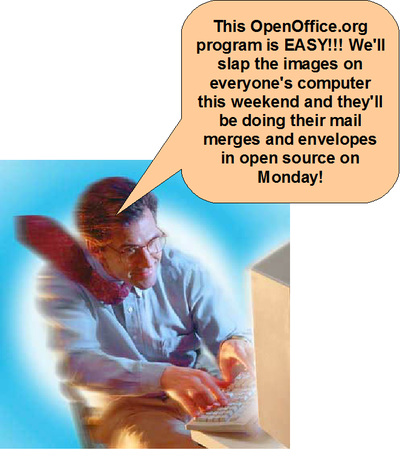 ADDENDUM: TO MAKE IT CLEAR THAT EVERYONE IN THE ORGANIZATION WILL LEARN OPENOFFICE.ORG AND THAT MAKING A FUSS WILL NOT BRING BACK THE OLD OFFICE SUITE. It's a good idea for someone with authority to send an email like this to all employees. A friendly but direct email from the CEO or whoever is appropriate stating something like this. Make it clear that there will be few or no exceptions, there is no turning back, and that kicking up a fuss will not bring back the old office suite. One of the essential attributes of a successful company is the ability to adapt to changing circumstances, and take advantage of new opportunities and tools. Based on the changing marketplace and emergence of new types of software, I and other members of the ACME team, decided to evaluate OpenOffice.org, a powerful and free open source office suite compatible with Microsoft Office. OpenOffice.org has a text processing module like Word, a spreadsheet like Excel, a presentation tool like Powerpoint, as well as database capabilities and a drawing program. 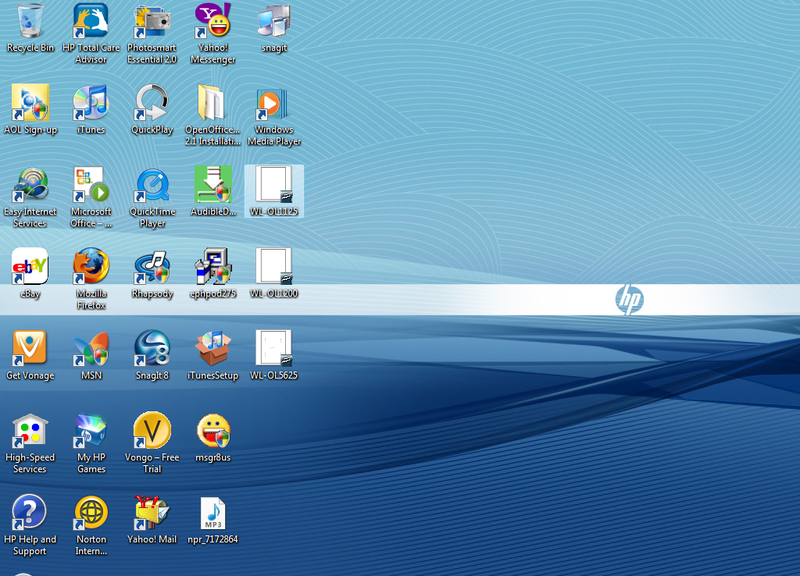 The programs look quite similar to Microsoft Office. To learn more, go to www.openoffice.org. I have decided that ACME will switch to OpenOffice.org. OpenOffice.org is a good choice for ACME for many reasons, including its excellent feature set and the enormous amount of money we will save by not paying for Microsoft Office licenses. The transition to OpenOffice.org will be phased, not immediate. We have begun the transition with a pilot program and will begin the official rollout on ________. The rollout will take approximately __________ and by __________, the company will be using OpenOffice.org as its official office suite. I understand that making this change might seem alarming. Rest assured that the change will not be immediate. All employees will have the opportunity to use and learn OpenOffice.org for a minimum of ________ before being required to use it for work. All employees will provided with information about the program to help you learn it, and the help desk will support it. You can also download and install OpenOffice.org at home if you would like to use it as your home office suite. I use it myself at home and am delighted with it. I am confident that all ACME employees have the ability to learn the new program and do their jobs with the same high quality of excellence that has made us so successful. Thank you for your participation in this transition. An alert user pointed out to me a great new feature. It's the Easy Version of OpenOffice.org. I feel so silly -- I've been blogging all this time to show how to do things in the standard version, when there was an easy version to use, all this time. For various reasons, I suddenly bought a new HP Pavilion laptop last week ($800 down to $650!). One key reason was that I couldn't keep my old laptop going on AC, even with valiant attempts to duct-tape the cord to the computer hard enough or at the right angle to keep the juice going. So I'm the proud yet somewhat abashed owner of a slick new Vista-running laptop, with wireless internet (yay!) and various other features that weren't on my laptop that I bought in 2002. Vista -- well, it certainly seems attractive. Kind of a Macintosh look to the graphics. And lots of helpful things pop up so I'm sure that the OS is easier for some people. Frankly, I was expecting more of a dramatic difference given all the emotional pants-wetting that was going on. Anyway, the main point is that the first thing I did once everything was set up for the OS was to download OOo 2.1. It installed slick and runs fine.